Whether you’re studying for an Access, GSCE or A Level course, you’ll need to be able to write in good English. Developing your writing skills will not just help you make good progress with your studies, exams and coursework, but also in other areas of your life such as drafting a formal letter or helping your children with their homework. If you find it a struggle to get your thoughts and ideas onto paper, don’t despair. There a few very simple steps you can take that will equip you with much greater writing confidence, including reading, planning and drafting. What’s reading got to do with it? It’s easy to think that focusing entirely on your writing abilities is the only way to make progress, but reading is an essential ingredient in that progress. You don’t have to start wading through a Jane Austen novel, or grimace your way through Shakespeare or Dickens. Regular reading of any printed text, including newspapers and magazines, will help you to improve your spelling and grammar, and to better understand how to construct a piece of writing so that it follows a logical and fluent sequence. There is not a writer in the world who produces good pieces of work by simply putting pen to paper. Even the most talented and dedicated professionals spend time planning their work. 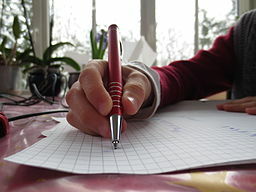 If you want to impress your tutor and get good marks for your coursework, you must plan every piece of writing. Make brief notes for the content of each paragraph, including your introduction and conclusion. To create a fail-safe plan, write the first sentence of each paragraph into your template. In order to present your piece of writing well, you should draft, re draft and draft again. This means reading over your work; cutting out unnecessary words or phrases; checking your spellings (use a dictionary); and considering the rewriting of sentences so that you can present the facts or your argument in a clear and accessible manner. If you are a drafting novice, don’t be afraid to ask your tutor about which areas of your writing are most in need of attention and revision. Reading your work aloud can help you to spot mistakes; and asking friends or family to have a look can provide much needed support and guidance. Writing well can be instrumental in exam success. Even if you are inexperienced and out of practice, if you read as widely as possible, plan your work and put time and effort into drafting, you’ll find that your writing is not just acceptable, it’s worthy of pride!